The index opened flat to positive and stayed in a narrow range but saw huge selling pressure in the second half to breach 8700, but came back to close just above at 8712.05, loss of 44.70 points. The broader market was also weak, with 610 advances to 912 declines. Developing Range as per Option Table comes at 8400-9000. 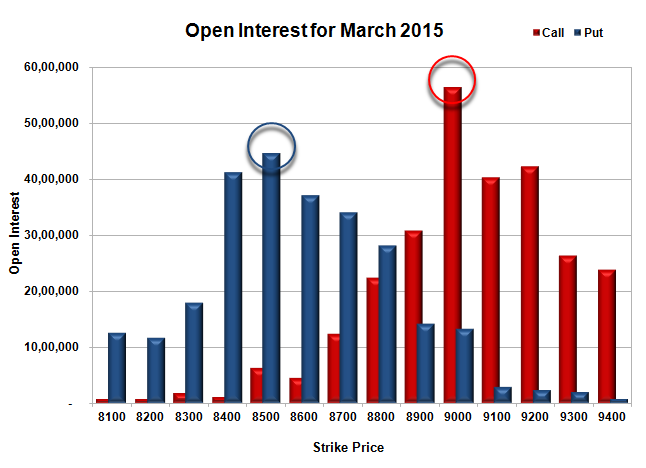 Call option 8600-8800, 9000 added huge 10.12 lacs OI with profit booking seen at 9100 and above strike prices. 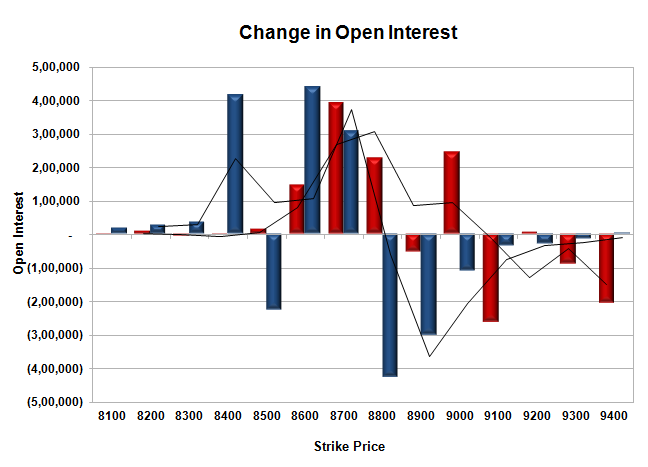 Put option 8700-8600, 8400 added huge 11.64 lacs OI with huge short covering seen at 8800 and above strike prices. Nifty Open Interest is at 2,48,11,425 down by 2,06,700, with decrease in price, most probably huge long liquidation. Bank Nifty Open Interest is at 22,08,350 down by 94,575, with decrease in price, most probably long liquidation. FII’s sold huge 8.53 lacs Futures, which includes 20271 contracts long liquidation and 13867 contracts short build-up, with decrease in net OI by 6404 contracts (includes 54282 longs to 88420 shorts for the day) and the Average Price comes to 8823.44. FII’s Index future open contract as on date is 789000 Longs to 126596 Shorts, net long 662404 down by huge 34138 contracts. Initial support still at 8700, with OI of 34.14 lacs and below that at 8500 with huge OI of 44.70 lacs. Initial resistance at 8900, with huge OI of 30.93 lacs and above that at 9000 with highest OI of 56.36 lacs. 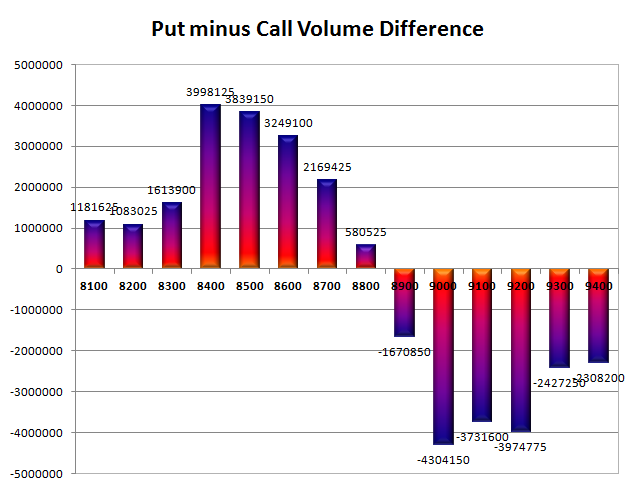 Day Range as per Option Table is 8630 - 8813 and as per VIX is 8641 - 8783 with 8722 as the Pivot.